How Many Elderly People Get Toenail Fungus? Toenail fungus affects roughly 32% of the population between the ages of 60 and 70, according to the Cleveland Plain Dealer. Nearly 50% of all people have had toenail fungus at some point by the time they reach age 70. Risk factors for toenail fungus include: poor circulation, diabetes, diminished immune systems, and nail trauma. These factors tend to become more prominent in old age. The probability of getting toenail fungus increases with age. How Many Young People Get Toenail Fungus? One study of physician office patients in Canada found that 0.7% of the toenail fungus cases were in patients under 19, compared to 18.2% of cases in patients 60 to 79 years of age. 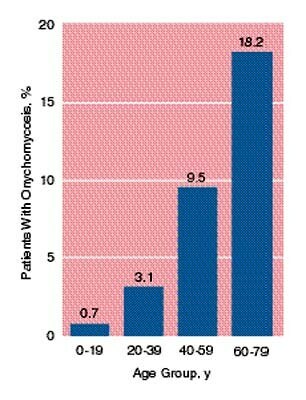 Another study of 2,500 patients in North America found that the prevalence among children under 18 dropped from 0.44% to 0.16%. The reasons for the decrease included less time spent in environments containing pathogens, smaller nail surface, and faster nail growth. 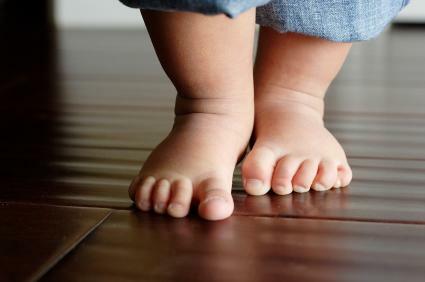 Toddlers can come into contact with the dermatophytes that cause toenail fungus too — or they can be genetically predisposed to contracting it. How Is Toenail Fungus Treated in the Old Versus the Young? When deciding upon a course of treatment for toenail fungus in the elderly, ease of application is important. In general, amorolfine and ciclopirox are not recommended for elderly patients because these treatments must be applied a few times a day for a long period of time. Terbinafine may be a good treatment, but has side effects like nausea, sinusitis, joint pain, and increased cholesterol — so patients should discuss the options with their doctors. The elderly need to be particularly careful to have their toenail fungus treated, though, as secondary bacterial infections and complications are frequent among their demographic. Griseofulvin is the primary toenail fungus treatment recommended for children, although the efficiency is questionable. Itraconazole and terbinafine are other therapies sometimes used, although the FDA has not specifically approved of their use in children. The problem with toenail fungus in old and young sufferers is the propensity for the fungus to return after treatment. Many people apply cream, use lacquer, take oral medication, or undergo laser treatment to the nails themselves, but forget to treat their socks and shoes. Therefore, the living fungal spores affect the toes and cause a recurrence that can last many years. The SteriShoe UV shoe sanitizer is a device that families can use to disinfect their shoes from fungus, virus, and bacteria. By sticking the device into the shoe and hitting the “on” switch, UV light will shine upon the insides of the shoes, killing 99.9% of the pathogens living there in the first pass. By using the device daily or even weekly, both old and young people who have had toenail fungus can greatly limit their exposure to the microbes that caused them so much grief. Check out the Sterishoe UV shoe sanitizer today! Diabetic Foot Care Toolbox: 10 Helpful Accessories to Prevent Complications Diagnosis Help Desk: Is It Athlete’s Foot or Dry Skin?